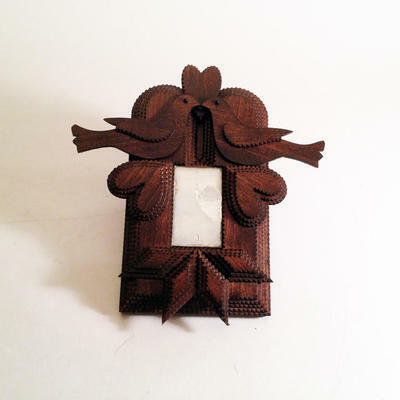 The Love Bird's Mirror is made with five layers of chip-carved wood. A vintage pocket/purse mirror was used for this piece. There is a leather loop on the back which can be used to hang this piece on the wall. It is finished with a custom mixed color of stain. Approximately 30 hand-cut and carved pieces of wood were used in creating this one-of-a-kind work of art.